I’m sad, I’m satisfied, I’m very impressed, I’m in a dilemma. I’ve just finished reading Battle of the Beetles, the final instalment of M.G. Leonard’s Beetle Boy trilogy, which means, very sadly, that the adventure is over. I’m satisfied, nay, very satisfied, because this final volume has lived up to the expectations raised by the previous two in the series, Beetle Boy and Beetle Queen. 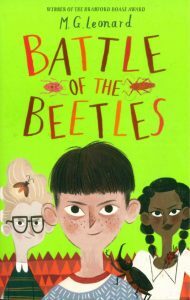 I’m very impressed because Battle of the Beetles is so much more than an adventure story. As well as being thrilling, heart-stopping, and full of action, it is also educational and raises some very important and thought-provoking issues. I’m in a dilemma, because how can I review this excellent book without giving away spoilers? First, just to reiterate this is a great book. It is a literary roller-coaster, featuring jungle escapades, martial arts, near-death experiences, family reunions, coleopteran gymnastics, terrifying events, pathos, bathos, scatological humour and a happy ending. In summary, a fantastic couple of hours entertainment. If you have read the first two books in the series, you won’t be disappointed; buy or get someone to buy Battle of the Beetles for you as soon as possible. If you haven’t read the earlier books you have some catching up to do. The underlying theme of this instalment is metamorphosis and physiology and be warned there is some very memorable and slightly disturbing imagery connected with these themes. You will never see Silphids (carrion beetles) in the same way again. Speaking of imagery, the illustrations by Karl James Mountford are stunning. While amusing and entertaining there are some very serious underlying concepts that hopefully will not be overlooked by readers. We learn about environmentally friendly means of pest control, e.g. pheromone disruption and the very successful and relevant real-life Sterile Insect Techniques (SIT). SIT was pioneered as a control technique against the screw worm, a serious pest of cattle in the USA (Baumhover et al., 1955; Knipling, 1955) and is now seen as a practical way forward for mosquito control or eradication (Benelli, 2015). This may however, be the first time it has been mentioned in a work of fiction for children. Another first for Maya Leonard. 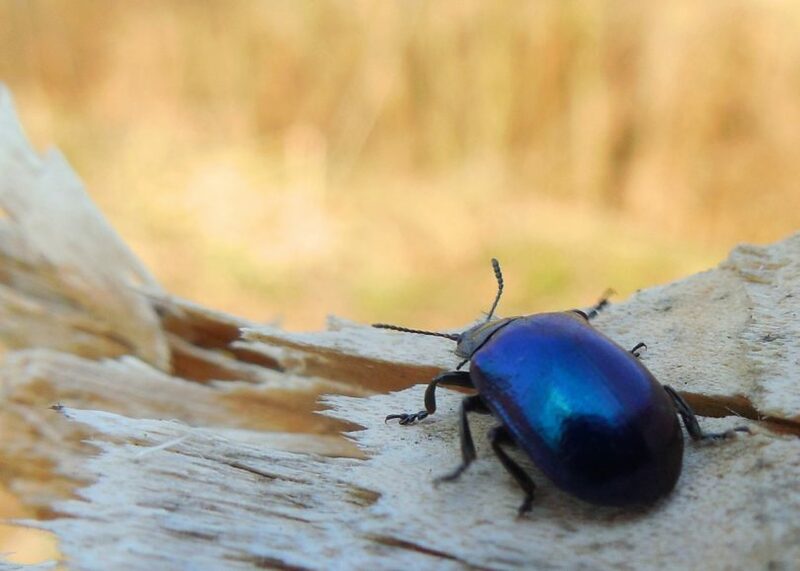 The lack of undergraduate entomological training in the UK also gets a mention (the good news is that the MSc in Entomology at Harper Adams University is shortly to be joined by a new undergraduate degree, Zoology with Entomology). The most thought-provoking theme is, however, that of rewilding, much in the news these days. How far would you be willing to go to conserve species and protect the environment? At one stage I almost felt sympathetic towards Lucretia Cutter; a truly brilliant twist to the story. I don’t think I can say much more without giving too much away. Embrace your inner beetle, throw away your prejudices and enjoy this fantastic adventure. An enthralling read for everyone aged nine and above, including entomologists and ecologists. Baumhover, A.H., Graham, A.J., Bitter, B.A., Hopkins, D.E., New, W.D., Dudley, F.H. & Bushland, R.C. (1955) Screw-worm control through release of sterilized flies. Journal of Economic Entomology, 48, 462-466. Benelli, G. (2015) Research in mosquito control: current challenges for a brighter future. Parasitology Research, 114, 2801-2805. Knipling, E.F. (1955) Possibilities of insect control or eradication through the use of sexually sterile males. Journal of Economic Entomology, 48, 459-462. About the Author (book review): Professor Simon Leather (BSc PhD CBiol Hon FRESI) is an applied entomologist at Harper Adams University, focusing mainly on problems in agricultural, horticultural and forest crops, but with an additional interest in urban biodiversity and insect conservation. Simon teaches at undergraduate and MSc level, and runs the only general Entomology degree in the UK. Follow Simon’s blog ‘Don’t Forget the Roundabouts’ HERE; Simon can also be found on Twitter as @Entoprof.